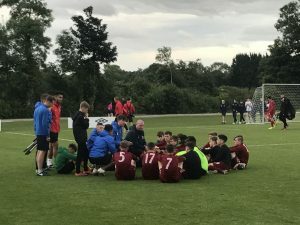 KILDARE were left heartbroken at the Kennedy Cup today after they were beaten in the cruellest fashion imaginable by Galway in the quarter-final. After Kieran Olateju’s eighth minute goal, Kildare led right up until the very last kick of the game when Galway managed to score direct from a corner kick to send the game into a penalty shoot out, which Galway went on to win 4-2. Olateju followed up Tuesday’s hat-trick against Cavan/Monaghan with a stunning volley from outside the box to open the scoring. There were few chances in the remainder of a closely fought half but Kildare went so close to doubling their lead just before the half time break. Ben Coen’s free kick into the box was headed against the post by Dean Owens, who then just about failed to turn the rebound home. Galway enjoyed the lion’s share of possession in the second half as they pushed for an equaliser but found a Kildare defence in outstanding form. Coen, Joe McBride, Ryan Bowden, Lee Flynn were superb and restricted to Galway to very few clear cut openings. With the powerful Victor Aibangbe ruling midfield, Kildare retained a threat on the break and they almost snatched a late goal when Dylan Murtagh’s shot was cleared off the line. After Kildare seemingly did all the hard work ,the heartbreaking moment in the last action of the game came when a corner somehow squirmed in at the near post. After the huge boost of scoring so late, Galway then scored all their penalties in the shoot out and won 4-2. It means that Kildare bow out of the main competition despite having never been behind in a game, and also at one stage going over three and a half hours of football without conceding a goal. The week isn’t over for the team though. They drop into the Plate semi-finals where they will contest for 5th-8th place. They play the Limerick Desmond League at 12.30pm on Thursday.